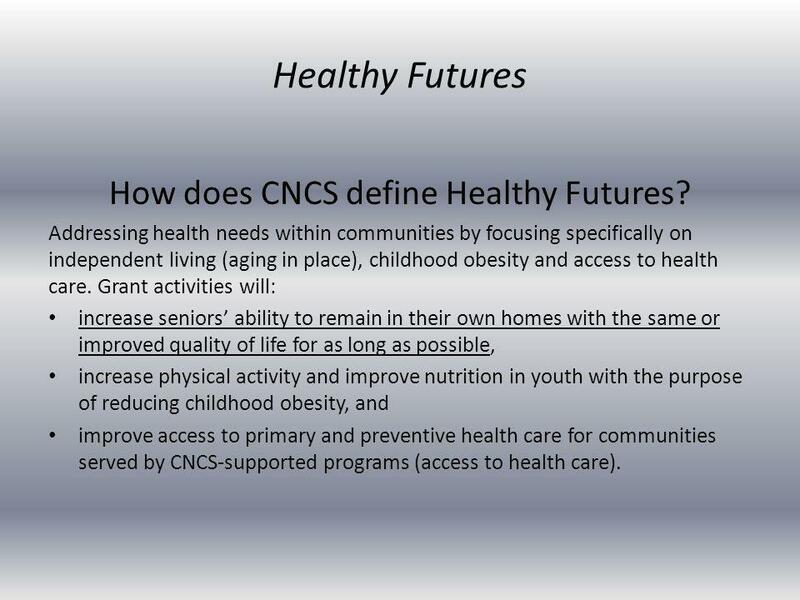 How does CNCS define Healthy Futures? 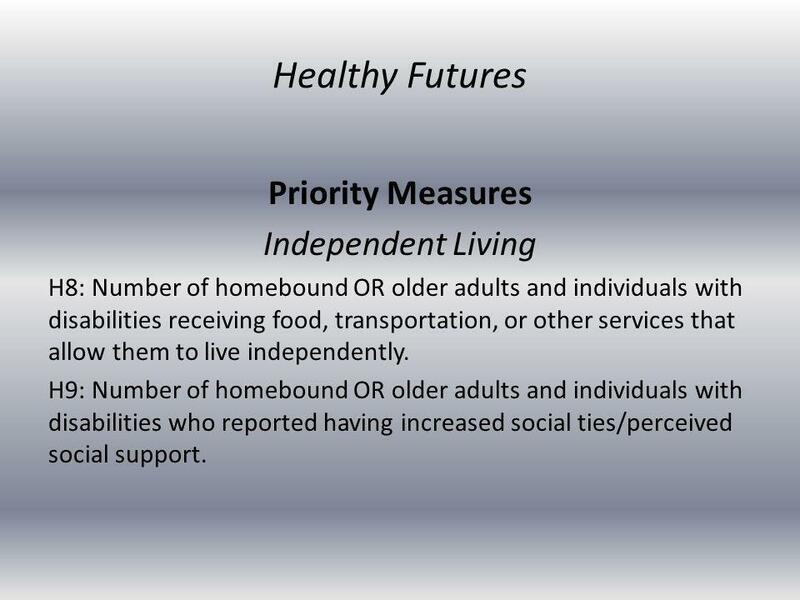 Addressing health needs within communities by focusing specifically on independent living (aging in place), childhood. 4 Questions/Issues in Healthy Futures Healthy Futures Objective 2 of the Strategic Plan has been expanded to include food security. The new wording is Reducing Childhood Obesity and Increasing Access to Nutritious Food. The Measures on hunger (H10 and H11) were moved from Economic Opportunity to Healthy Futures, and an aligned outcome (H12) was added. 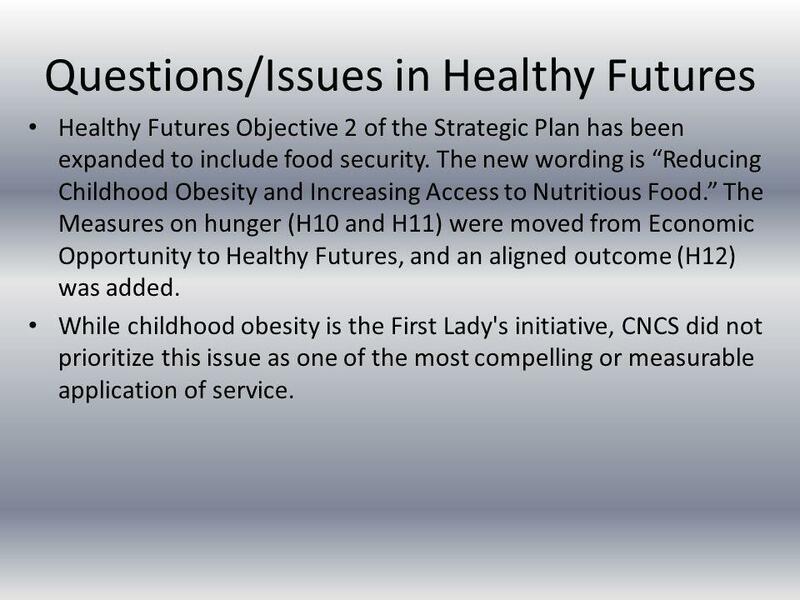 While childhood obesity is the First Lady's initiative, CNCS did not prioritize this issue as one of the most compelling or measurable application of service. 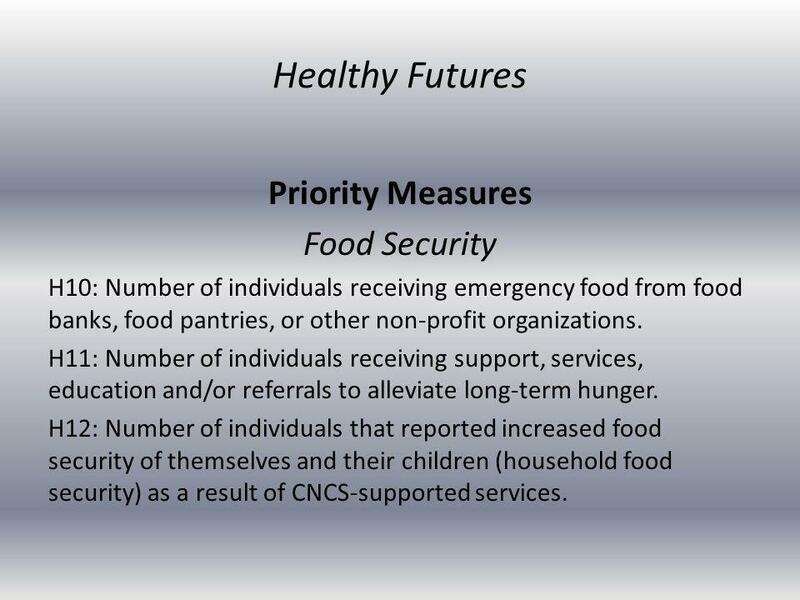 Download ppt "How does CNCS define Healthy Futures? Addressing health needs within communities by focusing specifically on independent living (aging in place), childhood." Description of the Focus Area Grants will help individuals and communities prepare, respond, recover, and mitigate disasters and increase community resiliency. Focus on Impact CNCS Performance Measurement Framework. Senior Companion Program Adapting to National Performance Measures for Independent Living and Respite Care. An overview of the National Performance Measures 118 NOVEMBER 2011 THE CORPORATION FOR NATIONAL & COMMUNITY SERVICE. Heather E. Brown. Wilmington Senior Center provides life-sustaining and life-enriching services, opportunities and partnerships that have a positive impact. Founded in 1995 by the National Association of Community Health Centers, Community HealthCorps is the largest health-focused, national AmeriCorps program. Food Insecurity and Health Lynne Giroux, RD Public Health Nutritionist Eastern Ontario Health Unit. Transition co-ordinator New role for transition planning. F as in Fat: How Obesity Threatens America’s Future Jeffrey Levi, PhD Executive Director Congressional Briefing January 26, 2011. The Capital Area Food Bank A Brief Introduction. Mission The mission of the Capital Area Food Bank is to feed those who suffer from hunger in the Washington. Fighting Hunger…Feeding Hope. SAFB…Feeding America Connection Nation’s leading domestic hunger-relief charity Provides food assistance to more than 25. COMMUNITY BASED ORGANIZATION, DIRECTOR BRIEF For leaders whose agencies serve low-income customers. HUNGER (FOOD INSECURITY) PERVASIVE IN INDIANAPOLIS AREA Children Seniors Suburbanites Food insecurity touches 1 in 5. Texas Food Policy Roundtable and State Fresh Food Initiatives Kathy Golson Senior Policy Advisor Texas Department of Agriculture.